by Adam L Silvermanat8:50 pm on October 3, 2016 . It has 177 Comments. I want to just add a strategic note to Tom’ post from earlier today. There are actually several very good strategic reasons to publicize the upcoming Mosul campaign even as the official start day is not announced. The first is to actually use the Information(al) element of National Power to pressure ISIL to abandon Mosul rather than suffer the types of battlefield defeat that it did in Ramadi and Fallujah in Iraq and in parts of Syria where the US led Coalition is attriting ISIL’s hold on actual territory. One of the first positive effects we’re trying to achieve is to get a team of engineers, under Coalition protection, on site to shore up at the Mosul Dam full time before the rainy season starts as we move into Autumn. The sooner, and the easier it is to get the engineers on site full time the better. If the Mosul Dam goes, there is going to be a tremendous complication added to the Coalition’s efforts in the region in terms of having to conduct humanitarian assistance and disaster management coupled with an increased flow of Internally Displaced Persons (IDPs) within Iraq and the impact on Iraqi agriculture, which is still not back to what it was prior to the 2003 invasion. This will be much easier if we don’t have to fight our way to the dam or if we don’t have to worry about ISIL blowing the damn to cover their retreat and complicate Coalition operations. The second reason to use the publicity about an impending attack, to leverage Information Power, to achieve the theater strategic objective is to ramp up the PSYOPS component of the potential attack. ISIL’s leadership is not stupid – they know an attack is coming to dig them out of Mosul. As a result they have to get their fighters on site in position and ready to fight. Sitting, day in and day out, waiting for an attack to come that doesn’t occur that day, even when everyone knows that the attack is, eventually, going to happen, saps morale. You can only keep troops mentally focused for an upcoming fight for a limited amount of time before they start to loose their focus. Every day that we make clear that the fight is going to come, that the force applied will be overwhelming for the ISIL fighters trying to hold the city, and nothing happens that day, is a day that ISIL’s fighters have spent mental focus waiting for an attack that will, but has not yet, come. As a result of what we’ve learned from the campaigns to liberate Fallujah and Ramadi, the less actual fighting that has to take place to retake Mosul the better it will be for the city and its residents. So anything we can do to make it harder for ISIL to actually fight works to our advantage. There are also two very important reasons rooted within Iraq’s socio-cultural context. The first is that by making it clear that Coalition backed and supported Iraqi regular and irregular forces are going to bring overwhelming force to liberate Mosul, we are also leveraging Information Power to keep our Iraqi allies focused on their upcoming task. A repeated problem that was encountered by US and Coalition Forces going back to 2004 was that it was often hard to get the Iraqis to show up, and if they did show up to actually fight. There were several reasons for this. For instance, in Anbar Province in 2005-2006 we had lined up Sunni tribal fighters to be trained to fight with Coalition Forces against al Qaeda in Iraq. However, there was a logistical delay getting these local forces to the training site. During that delay their villages had been hit by al Qaeda in Iraq and as a result our potential new local allies decided they had to go home and protect their kin. As a result we lost an opportunity to build a more cohesive, local irregular force to work with throughout the region. At other times we’ve spent a lot of time and money working with and training Iraqi Security Forces who, while they did fine in practice, would balk when the time came for them to apply force for real. I watched this personally one week in 2008 when I was working with my brigade’s Military Training Team (MiTT). Reports came in the night we arrived to embed with the MiTT of an attack on some Iraqis. The MiTT leader tried to get the Iraqi Army battalion commander he was working with to respond, but he wouldn’t. The next morning, however, we quickly had to gear up and get on the road to follow this Iraqi Army battalion as they rushed from their base to the middle of nowhere to see what had happened – 14 hours after the attack was reported. What you’re seeing in the US led Coalition’s publicizing the upcoming campaign to liberate Mosul is an attempt to use the other edge of Information Power to keep our Iraqi allies focused and ensure that when the day comes to begin that offensive they are ready and able to do so. I can not emphasize enough the damage that Saddam Hussein’s tyrannical government did to Iraqi confidence in their ability to accomplish things as Iraqis, especially military operations. A great deal of our partnering, advising, training, and assisting has been not just teaching the how of soldiering or policing, but also the less tangible and harder to inculcate why to do so – including building morale and esprit de corps. Finally, the last reason to publicize the upcoming campaign to liberate Mosul is related to the need to keep the Iraqi Security Forces and irregular forces on actually going through with the campaign. As you can see in the map images below, Mosul is very close to the areas that are currently part of the autonomous areas of Iraqi Kurdistan (the Kurdish Autonomous Area). And Mosul is an ethnically mixed city – it has both Sunni Arabs and (Sunni) Kurds living together in proximity. If you look at Map 1, you can see where the Iraqi Kurds were able to extend their lines by the end of 2013/beginning of 2014. As you can see in Map 1, by the late Winter of 2014 the Iraqi Kurds had extended their lines beyond Iraqi Kurdistan to the areas of Iraq that the Iraqi Kurds have claimed, and want added to Iraqi Kurdistan. Most important among these is the city and province of Kirkuk, but Mosul is also historically important for the Iraqi Kurds. Map 2, below, shows the distribution of Iraqi Kurds as an ethnic group in Northeastern Iraq and the boundaries of Iraqi Kurdistan. Mosul and Tikrit are contested areas between Iraq’s Arabs and Kurds. In 2008 I was told repeatedly by both Sunni and Shi’a tribal and religious leaders (sheikhs and imams) across Central Iraq that the one thing that would definitely make Iraq’s Sunni and Shi’a Arabs cooperate was if the Iraqi Kurds took Kirkuk. Now this was in the 2008 context as opposed to the 2013-2014 context of the Iraqi Peshmerga fighting against ISIL and establishing their forward lines at the farthest points out from Iraqi Kurdistan that they could hold territory against ISIL. However, the Government of Iraq is dominated by Arabs not Kurds. As are the Iraqi Security Forces, though a significant portion of the Iraqi Army is made up of Iraqi Kurdish Peshmerga. So here too we are trying to leverage Information Power to keep the pressure on the Government of Iraq and the Iraqi Security Forces to go and liberate a city that is ethnically mixed and that is contested between Iraqi Arabs and Kurds. The intention here is to ensure that Iraqi Arab regular and irregular forces show up and fight to liberate a city that may wind up under Kurdish control in the future. This is not necessarily an easy task, so leveraging Information Power to ensure the campaign actually happens is important. It is this strategic nuance of National Power (Diplomatic, Information, Military, and Economic/the DIME), and how to leverage it that neither Donald Trump nor his advisors seem to understand. Moreover, it demonstrates a lack of understand of the theater strategic contexts in which US and Coalition Forces are working in Iraq. We already have a real world/real time example of what happens when the strategic regional context is not taken into before a major operation is undertaken in the Levant: the 2003 US invasion of Iraq. While the element of surprise may be tactically important, the strategic ability to leverage Information Power to one’s advantage is also a very important tool that should be used whenever possible. This post is in Foreign Affairs, Military, Politics, Silverman on Security, War and has 177 Comments. by Adam L Silvermanat3:08 pm on September 8, 2016 . It has 71 Comments. Interestingly enough Judicial Watch FOIAed Vice President Cheney’s Energy Working Group back in 2002 and before Vice President Cheney shut the release of records off this was one of the items released. I first heard about this map in 2003 or 2004 when Greg Palast was interviewed by Keith Olbermann. Palast is a forensic accountant and had, himself, been looking into VP Cheney’s Energy Working Group. He came across the map as a result and eventually wrote the whole thing up as a chapter in his book Armed Madhouse. But what’s really important about this map is its history. So let me tell you a story… In the early part of the 20th Century, around 1912 or so, a young Armenian citizen of the soon to be defunct Ottoman Empire was becoming a major player in the early petroleum industry. His name was Calouste Sarkis Gulbenkian, but he is better know as Mr. Five Percent. Gulbenkian basically established what would become the Iraqi petroleum sector – his fee/reward for doing so was a 5% stake, hence his nickname. The map above is a representation of the estimates of where Iraq’s oil was, updated to include where exploration has happened. But compare it to Map 1 – you’ll notice the exploratory blocks are missing. There’s a reason for that. And that, my friends, is where the story really gets interesting. Gulbenkian got 5% and the Seven Sisters Oil Company and their early controlling interests, which would eventually evolve into OPEC, got 95% of the rights to exploration. This was all part of something called the Red Line Agreement and Map divvying up the Middle East’s oil. Part of the little known history is that a decision was made, based on the exploratory blocks in Map 2, to keep Iraq’s oil in the ground. Palast details this history in his book, but the decision was made to treat Iraq like a strategic oil reserve. When my teammates and I were getting ready to deploy to Iraq, but before we left training and attached to our Brigade Combat Team (BCT), we went through three different initial cultural preps of the operating environment. This was because they kept moving where they were sending the BCT (third time was the charm!). Initially we were going to Salah al Din Province, near some of the denoted oil fields in Map 1. And this is where I started paying attention to Map 2 as something other than a curiosity. One of my research managers had found an expatriate Iraqi, now a US citizen, with PhDs in agricultural and civil engineering who had worked for Saddam Hussein as the lead on various projects, including some dealing with the petroleum sector. He ran afoul of Saddam, was imprisoned, then Saddam – being capricious – changed his mind and rehabilitated him. Our source, smartly, made plans to flee as soon as he could. And he did so successfully. He graciously agreed to meet with the team so we could pick his brain. One of the questions we were able to ask was about Map 2. Was it legit? 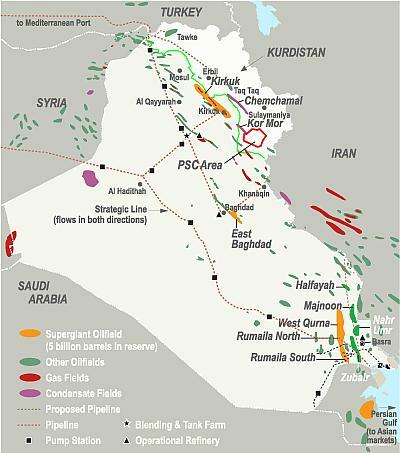 Was the bulk of Iraq’s oil really along the western border with Saudi Arabia? Was the history of Mr. Five Percent accurate? Things like that. Our source informed us the map was accurate, that the Iraqi Oil Ministry had always known that the bulk of their reserves were along the western border, and that was not where any of the actual exploitation of the resources were being done. He also confirmed that the decision to use Iraq’s oil as a strategic reserve from before it was an independent state (and before there was an OPEC) was also correct and that OPEC did, indeed, limit Iraq and Iran to not producing more oil than the other in any given year. This last requirement was supposed to tamp down the historic rivalry, but seems to have made it worse. Why is any of this important? Quite simply its because the actual bulk of Iraq’s oil is in the western areas of Iraq. Specifically in Anbar Province. The Sunni tribes, who first fought us, then allied with us after the Sawha/Awakenings, control Anbar. The other western provinces of Iraq – Najaf and Muthanna are primarily Shi’a – including the holy sites and religious academy in Najaf. The people of these three provinces are sitting on a (black) gold mine. Given that there is virtually no active exploitation in the exploratory blocks along Iraq’s western border, taking Iraq’s oil isn’t just a matter of putting the entire operational US Army on the ground to protect the petroleum workers that are going to pump it out and then the oil’s transport out of Iraq. It would require building an entire new set of extraction infrastructure in a hostile environment – both physically and societally hostile to such efforts. And that is provided Map 2, after 100 years, is still accurately indicating where Iraq’s oil is. An additional concern is that a lot of Iraqi oil is not suitable for gasoline production as it is not light sweet crude. Rather it has large amounts of sulfur and other compounds in it that make it expensive to convert to anything but heating/fuel oil. This is largely what the refinery at Baiji is producing when its running. This post is in Election 2016, Energy Policy, Open Thread, Politics, Silverman on Security and has 71 Comments. The Battle for Fallujah (Has Once Again) Begun! by Adam L Silvermanat10:09 pm on May 22, 2016 . It has 76 Comments. Earlier today, which is already tomorrow in Iraq, Iraqi Prime Minister Haider al Abadi announced that Iraqi Forces (regular Iraqi Army and [most likely the National] Police, as well as irregular forces from the sectarian and tribal militias) had begun their operations to retake Fallujah. From the Iraqi perspective, specifically the Iraqi leadership’s perspective, this is necessary to take the remaining Islamic State pressure off of Baghdad. This is because Baghdad as the seat of government is the core of Iraq for the Iraqi leadership, whether it makes strategic, operational, or tactical sense. What should be of great concern to everyone is whether the fate of Fallujah is similar to that of Ramadi. The Iraqis retook it, but it was reduced to rubble. And as Major Mohammed Hussein, a member of the counter-terrorism battalion that was first into Ramadi at the start of the offensive remarked: “All they (Islamic State) leave is rubble. You can’t do anything with rubble.” Islamic State has, apparently, mined and wired explosives throughout Fallujah as they did in Ramadi and there is a large civilian population trapped within the city and behind the enemy lines. The Iraqi’s have conducted an Information Operation informing these civilians to fly white flags from their buildings so they won’t be targeted by the Iraqi Forces. Unfortunately if they do so they will be targeted by the Islamic State Forces for collaboration. * Image from Voice of America. This post is in Foreign Affairs, Silverman on Security, War on Terror aka GSAVE® and has 76 Comments. https://www.balloon-juice.com/wp-content/uploads/2015/11/balloon_juice_header_logo_grey.jpg 0 0 Adam L Silverman https://www.balloon-juice.com/wp-content/uploads/2015/11/balloon_juice_header_logo_grey.jpg Adam L Silverman2016-05-22 22:09:262016-09-20 12:56:18The Battle for Fallujah (Has Once Again) Begun! by Adam L Silvermanat12:07 am on May 1, 2016 . It has 129 Comments. Yesterday a large number of Iraqi Shi’a stormed into the Green Zone in protest and occupied the Iraqi Parliament. The immediate driver of this activity was a call by Muqtada al Sadr for the Iraqi Parliament to actually convene and take a vote on pending legislation to force Iraqi Prime Minister al Abadi to replace ministers with non-partisan technocrats. The real cause of the unrest is with the way power is currently portioned out within the Iraqi government, which is partially done by sectarian allotment among Sunni Arabs, Shi’a Arabs, and Kurds. When the current Iraqi government’s institutions and structures were being rebuilt one of the reforms was a very, very soft form of consociational (confessional) representation. Perhaps the best known example of this type of system is in Lebanon where certain numbers of seats in the Lebanese Parliament and certain ministerial and military positions are reserved for members of specific Lebanese sects in order to force power sharing, compromise, and the creation of a functional civil space among the often hostile and antagonistic Lebanese sects. Iraq’s system isn’t a full consociational system as the elections to Parliament are based on party lists, not sectarian quotas regarding seats. Though in practice the party lists have produced a Shi’a majority bloc, with both Kurdish, Sunni, and mixed sectarian minority blocs within the Iraqi Parliament. Iraq’s consociational system instead focuses on having some ministerial positions allotted in a consociational manner to force power sharing and compromise. It has, unfortunately, not always worked effectively, and has been a source of serious contention, and a conduit for corruption. One of Prime Minister al Abadi’s goals has been the reform of this system by transitioning it away from consociationalism based on sectarian confession (Shi’a and Sunni) and ethnicity (Kurd) and towards a technocratic form of government. Unfortunately this has been stalled out; largely because those currently benefiting from the consociational system don’t want to give up those benefits so the legislation is stalled and a quorum cannot be produced in Parliament. The longer it drags on, the more the frustration grows. And today a lot of that boiled over. The good news is that the Iraqi Security Forces are not treating this as a type of activity that requires a counterterrorism response. This is a very good sign and watching the response of the Iraqi Security Forces and the Interior Ministry will provide us with important information going forward. This post is in Enhanced Protest Techniques, Foreign Affairs, Politics, Religion, Silverman on Security and has 129 Comments.